Providing excellence in education since 1896. SV INVITES YOU to join us in our annual open house. Our 2019 Open House is scheduled for Sunday, January 27th from 10:00am to 1:00pm at the Elmentary School and Monday, January 28th from 5:00pm to 7:00pm at both the Elementary School and Jr./Sr. High School. We open our doors to offer prospective new students and their families the unique opportunity to meet our staff, visit our classrooms, and tour our school. Come join us and learn about what SV has to offer! All you need to bring are any questions you may have for us! TUITION SCHOLARSHIPS are available through the Archdiocese of St. Louis! The application process begins January 28, 2019 and ends February 28, 2019. SV families are eligible for two different scholarships: Alive! In Christ and Beyond Sunday. Alive! In Christ scholarships are offered K – 8 and target low income families. Once a scholarship is awarded it is renewable for each school year through 8th grade. income families. Once a scholarship is awarded at the elementary level it is renewable through 8th grade. Families can then reapply for a scholarship for high school, which is called the Beyond Sunday Fellows Program. If awarded it is renewable each year. Scholarships for the 2018/2019 school year totaled $274,450 with 73% of the families that applied received a scholarship! The application process for scholarships for the 2019-2020 school year is completed through the Today and Tomorrow Education Foundation website using the following link: TTEF-STL.ORG. In addition to the scholarships offered through the Archdiocese of St. Louis, St. Vincent de Paul Parish also offers tuition subsidy. Families must first apply for scholarships through the Archdiocese to be considered for the subsidy through the parish. 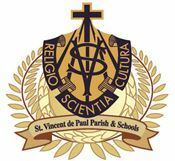 New to the coming school year, the parish will also be offering a $500 tuition credit to newly transferring students to SV! If you have any questions about tuition or scholarships, please contact Todd McDonald at 573-846-1067 or tmcdonald@svdepaul.org. All families are invited and encouraged to apply for the various scholarships! DID YOU KNOW that SV has been providing excellence in education since 1896? Rich in tradition and rooted in our Christian values, SV offers a rigorous K - 12 academic curriculum, spiritual development and guidance, and character education for all students. STUDENT LIFE at SV is rich with activities for students of all ages! From special events to sports games and pep rallies to activities that promote positive behavior, students are given every chance to excel! Click to see the “Student Life” photo gallery! If you cannot join us for our Open House, contact us at any time with questions about SV Schools or to schedule a tour. We realize choosing a school for your child is something that requires a lot of research, thought, and prayer. Please don’t hesitate to reach out!